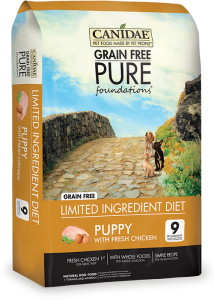 CANIDAE® Grain Free PURE Foundations® Formula is formulated to meet the nutritional levels established by the AAFCO Dog Food Nutrient Profiles for growth and gestation/lactation. LACTOBACILLUS ACIDOPHILUS** (MIN. )100 million CFU/lb. ​**Not recognized as an essential nutrient by the AAFCO Dog Food Nutrient Profiles. For pregnant or nursing females, we recommend free choice feeding. The Daily Feeding Guidelines are a good starting point on the amount of food suggested to be fed on a daily basis. If you feed more than once per day, simply divide the Daily Feeding Guidelines by the number of times fed per day. Always provide plenty of fresh water. When changing to CANIDAE® Grain Free PURE Foundations, some puppies may do better by making a gradual transition over 7-10 days. Start with 25% of the new food mixed with 75% of the previous diet and gradually increase the new while decreasing the previous until the transition is complete. Store in a cool, dry place. Not for human consumption.